9.30-10.30 am – start the day the healthy way with bandstand yoga. Led by an experienced instructor, this weekly class is suitable for adults of all levels. No need to book, just bring a mat and a blanket and pay what you can. Call/text Romana on 07817 556390 for more info or just turn up on the day. 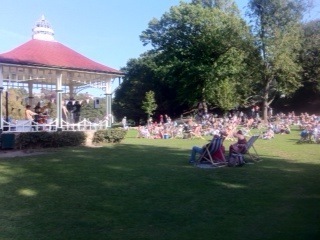 11.30am-1pm – children’s party on the bandstand with the fantastic Bob Butler. We promise plenty of laughs and a good time to be had by all at this fun and free children’s party with this amazing children’s entertainer and a party picnic to follow! 2-4pm – Maidstone Wind Symphony. We advise arriving early and bagging a deckchair for this wonderful, 40-strong wind orchestra’s stunning performance, taking in marches, songs from the shows and much, much more! 5-6pm Smokestack Lightning. We’ll be keeping the deck chairs out for these guys, but we can guarantee you’ll be dancing! This fabulous local band perform some of the best 60s rock and roll and blues classics – a thoroughly feel-good experience. 6-7pm The Bleeding Hearts. A quick change of tone but not of personnel as these guys show how versatile they are. Rounding off the day with a powerful and beautiful set, they will set the seal on the weekend with style. eat @ the Park Cafe will be open until 7.30pm for this event, and to add to the party atmosphere, check out our pop-up cafe and bar services, too. Pimms, anyone? Next post: Stade Saturday 13th July – the Moulettes!